Spray 3-quart slow cooker with cooking spray. Cook and drain macaroni as directed on package—except cook only 6 minutes. In large bowl, mix evaporated milk, milk, cheese product, salt, mustard, black pepper and red pepper. Stir in macaroni. Pour mixture into slow cooker. In small bowl, mix pork and 1/4 cup barbecue sauce. 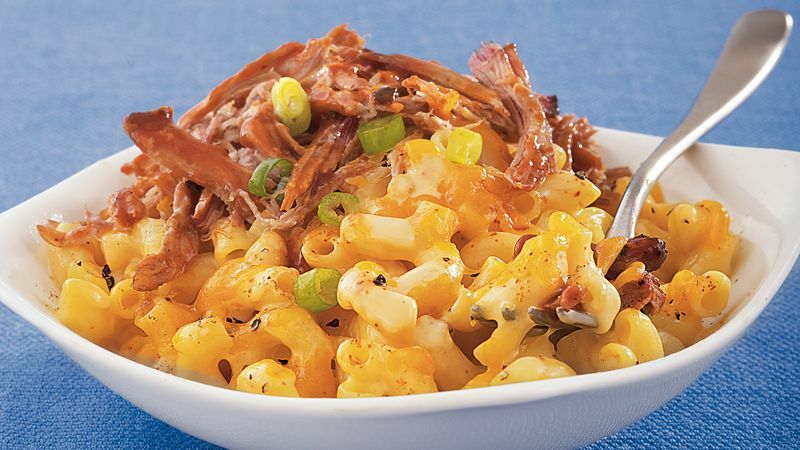 Stir macaroni and cheese in slow cooker. Top with pork. Sprinkle with Cheddar cheese. Cover; cook 1 hour longer or until set in center. Serve with additional barbecue sauce. Garnish with onions.